I’m a big fan of multiple-clipboard utilities, which store multiple recent clipboard contents, letting you paste any of them at any time. With one of these utilities on your Mac, if you need to cut and paste multiple sections of text, you can cut each one in turn, and then paste them wherever and in whatever order you want. And you never need to worry about copying or cutting text and accidentally overwriting existing Clipboard contents you still wanted to use. But these utilities have varying levels of complexity and power, a wide range of prices, and different learning curves—for someone who’s never used a multiple-clipboard utility, the idea of choosing and using one can be a bit intimidating. Or, at the very least, it can be difficult to grasp how useful they can be until seeing one in action. Today’s Gem, CmdVees (Mac App Store link), is a multiple-clipboard app, but its developer has taken a unique approach by making the software dirt-cheap and focusing on a specific use: copying several bits of text sequentially and then pasting those items, one after another, elsewhere. When CmdVees is running, any bit of text you copy or cut, using the standard Edit-menu commands or keyboard shortcuts, appears in CmdVees’ systemwide menu, newest at the top. 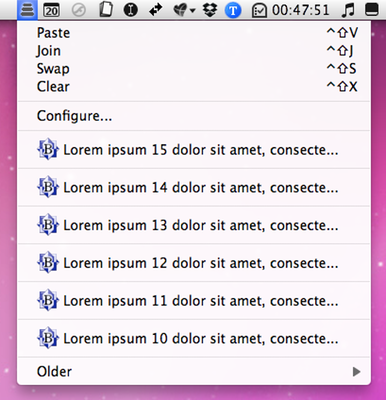 You can paste any snippet by choosing it from the menu or by using CmdVees’ own keyboard shortcut for Paste. CmdVees calls this menu of recent clipboard contents the stack. What makes CmdVees different than most multiple-clipboard utilities is that when you paste a saved clipboard snippet, it’s removed from the stack (and, thus, the menu). This means that if, for example, you copy five bits of text, you can paste all five sequentially by simply pressing the Paste shortcut five times—the first item in CmdVees’ history is pasted and removed from the stack, then the second, then the third, and so on. With many utilities, repeatedly pasting would simply paste multiple copies of the most-recently copied snippet—to get the most-recent five, you’d need to view your clipboard history and choose each one separately. CmdVees is a huge time saver when you’re copying a bunch of text from one document or Web page for pasting elsewhere. Instead of copy, switch apps/docs, paste, switch, copy, switch, paste, and so on, you simply copy, copy, copy, switch, paste, paste, paste. CmdVees is also convenient, to give another common example, when you receive a username and password in an email and you want to use those to log in to a Website or server—you just copy, copy, switch apps, paste, paste. One of my favorite little touches is that CmdVees displays recently copied items at the top level of its menu, but sticks older snippets in an Older submenu—you can choose the time, in seconds, after which a snippet is considered “old.” Since you’re more likely to paste items you recently copied, this feature makes the menu more manageable while keeping older items around, just in case. You can configure your own keyboard shortcuts for Paste, Join, Swap, and Clear, as well as a separate shortcut for a standard Mac OS X paste (which doesn’t remove anything from the stack—useful for those times you actually want to paste the same thing multiple times). This means, for example, you can continue to use the standard OS X keyboard shortcut for Paste but use CmdVees’s features when you need them. My biggest complaint about CmdVees is that I wish it had an option to add items to the bottom of the stack instead of adding everything to the top. The current behavior means that if I copy five things in the order I want to paste them, I need to paste, then move the cursor to the beginning of the newly-pasted text, then paste again, then move the cursor to the beginning of that text, then paste, and so on. Similarly, the Join feature would concatenate these snippets in reverse order. (The workaround is to copy or cut items in reverse order, which results in them being in the correct order when pasted or joined.) If I could optionally add items to the bottom of the stack, I could clear the stack, make my copies or cuts, and then paste, paste, paste, paste. CmdVees doesn’t have nearly as many features as the more-advanced multiple-clipboard utilities out there, such as PTHPasteboard Pro. And because it doesn’t keep a permanent history—it clears items as you paste them—it doesn’t give you as much “clipboard security.” But it’s only a buck, and for its more-focused goal of letting you store and sequentially paste multiple recent snippets of text, it’s in some ways more appealing. When you’re not using that feature, CmdVees stays out of the way and lets you use the Clipboard normally.